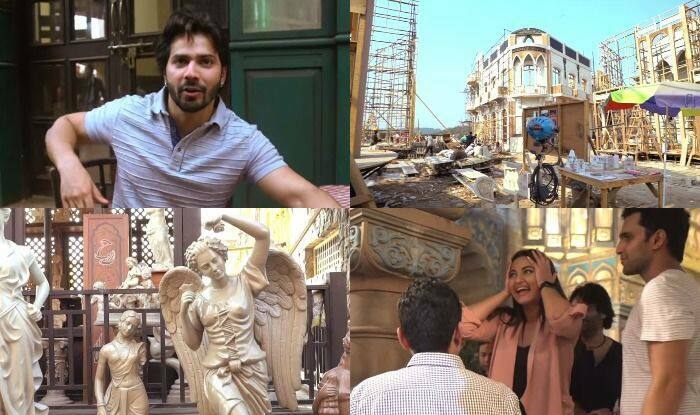 Varun Dhawan and the team of Kalank gives a tour of the set and how it was made in just three months. One of the most anticipated films of the year Kalank is all set to hit theatres on April 17 and ahead of the release of the film, the makers unveiled a behind the scenes video of creating the set. Fox Star Hindi, took to their youtube channel to share a video of the making of Kalank. In the video, the makers reveal intriguing details about how the set was created. It took 700 workers to create the set in three months. Varun Dhawan, who is playing the role of Zafar in the film, was awestruck to see the model. His immediate reaction was, “very nice ya.” The film will take you back to 1945 during the time of India-Pakistan partition and the makers have definitely done justice in creating the right vibe through the set. Varun then introduces the audience to ‘Zafar’s Ilaaka.’ He showed almost everything except for Zafar’s house. He went on to reveal that few handicrafts were flown down from Afghanistan. Cinematographer Binod Pradhan said that this was the largest set he has ever worked in, in his whole life. He compared it with the set of Dev Das and said that this was bigger. Sonakshi Sinha, who is playing the role of Satya, was in complete shock to see the set and said, “This is madness.” Javed Akhtar, on the other hand, could not believe his eyes and said, “unbelievable”. The film has an ensemble cast consisting of Madhuri Dixit Nene, Sanjay Dutt, Alia Bhatt, Varun Dhawan, Sonakshi Sinha, and Aditya Roy Kapur.